What is the difference between component and composite? This article originally ran several years ago. I thought it was time to bring it up again. Sometimes they don’t make it easy. The photo you see above is a component video cable. It’s got three RCA connectors and one of them is red. Seems simple enough. This photo is a composite video cable. It’s got three RCA connectors and one of them is red. Right now you’re thinking, who the <honk> made two different kinds of cables that look practically identical? Relax, it’s not as bad as you think. 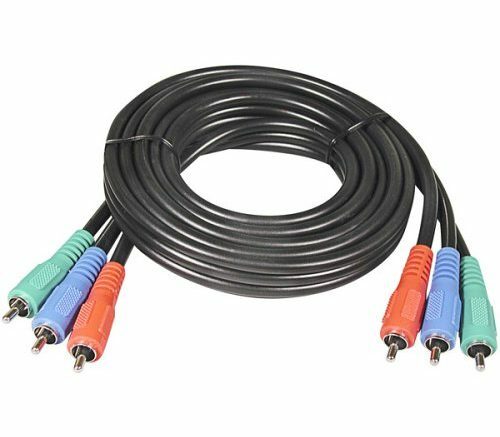 Component cables are designed for HDTV. Even though they don’t actually carry the red, green, and blue signals separately, the RGB cable designation shows you that these cable are intended for HD video only. HD video uses quite a bit more “bandwidth” (we’ll explain that in a minute) so if you’re going to use an analog video cable like this one, you need three connections to carry the information. This connection is video-only… you would need more cables to carry the audio. Composite cables are designed for older, standard definition systems. The yellow plug carries the video, while the red and white cables carry the audio. This was sufficient for home video systems until about 1987, when it became obvious that new, higher-quality systems would need better connections. When installing these cables, connect the plugs to the correctly colored jacks on the back of your system. You will notice that your system has two red jacks, which isn’t confusing at all, right? Generally the cables are in a row across. If connecting component, plug the green and blue cables in, then plug in the red cable next to it. Really, component cables should be very thick and well-shielded. This is because the HD video signal needs more bandwidth. Bandwidth is something like the thickness of a pipe. A larger pipe means more water can flow through it, it doesn’t guarantee that more water does actually flow through it. However, if all you have is two sets of red/white/yellow cables, and you need to hook up via component, it will probably work. The picture won’t be as clear as it could be but in a pinch it will be fine. And component video cables make good composite cables in a pinch too. Really, in most cases today you will be using HDMI, but understanding the difference between these two types of cables may add a little flexibility to your system. NICE AND EASY: What does a red light on a DIRECTV Genie Client mean?